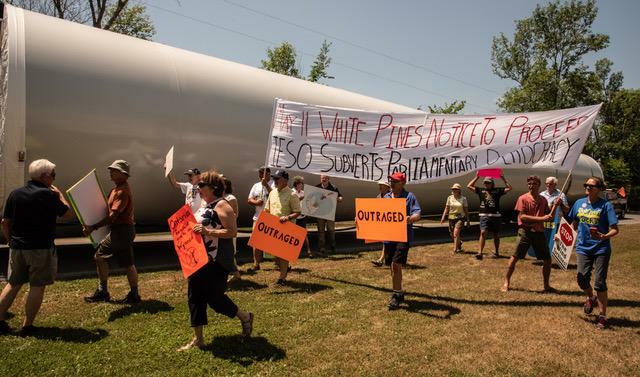 It is with great pleasure that APPEC announces the termination of the White Pines Wind Project. Bill 2 was passed into law late yesterday afternoon following the third and final reading and the proclamation of royal assent. Councillor Steve Ferguson has let us know that WPD has informed the municipality that there will be no further construction and that they are securing the sites and making them safe. We greet this news with joy – and a big sense of relief. It has been a long haul to this point. We congratulate our new provincial government for acting decisively to cancel a Project which should never have received a Renewable Energy Approval in the first place, much less been permitted to be in development for almost a decade after failing to meet one milestone date after another. 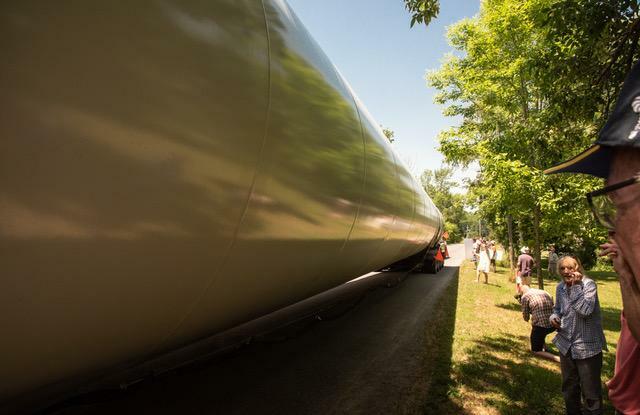 We are exceedingly grateful to MPP Todd Smith, Minister of Government and Consumer Services and Government House Leader, not to mention our elected representative, for his instrumental efforts in bringing about the cancellation of the White Pines Wind Project. Todd’s speech in the legislature yesterday was very moving, and he even personally named many of the wind warriors involved for years to keep the County turbine free. To quote Todd: “a promise made is a promise delivered”. 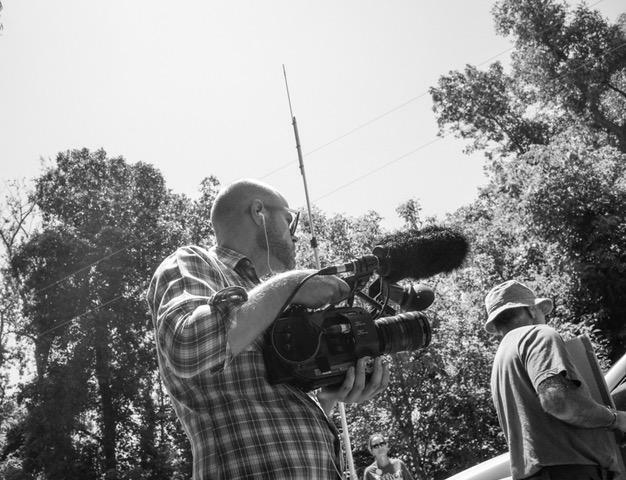 Special thanks is also owed to Mitch Heimpel for his efficient assistance in communicating our concerns with the White Pines Wind Project at the provincial level. We are also grateful for the longstanding support APPEC has received from our Mayor and Council. A heartfelt thanks to Councillor Steve Ferguson for his tireless efforts on our behalf. Lastly, we have APPEC members and other allies to thank for standing with us for so many years, and for their enthusiastic support of all our efforts. Fundraising will need to continue but the battle has at last been won! We are looking forward to turning the page and moving forward together as a community. The Citizen Action Photo Op that was held today at Bond Road and County Road 10 was a great success with 40 to 50 people involved. 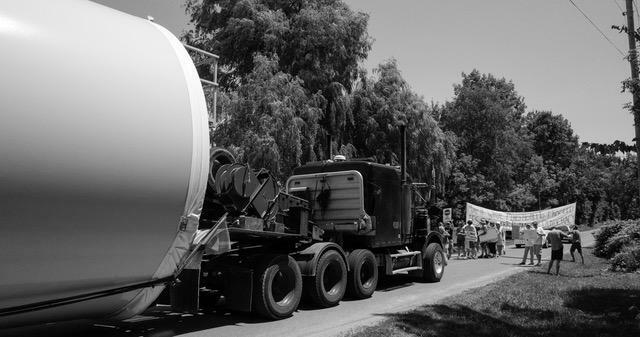 The joint citizen action only delayed the delivery of large wind turbine parts for a short period for the Photo Op. All local media was present. 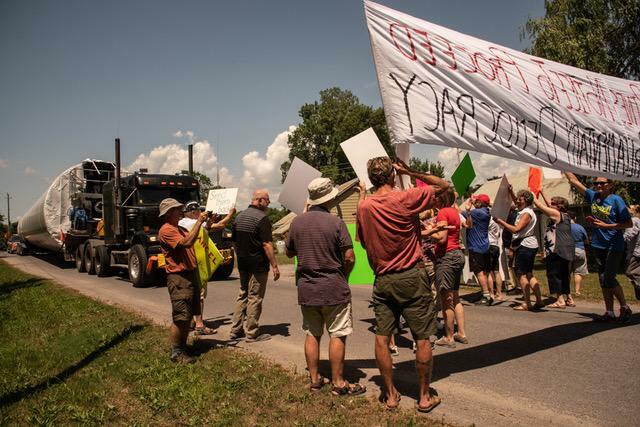 The objective was to demonstrate County citizen anger and dismay towards the IESO for issuing a Notice to Proceed (NTP) to wpd White Pines Wind Inc. after the election campaign was underway. 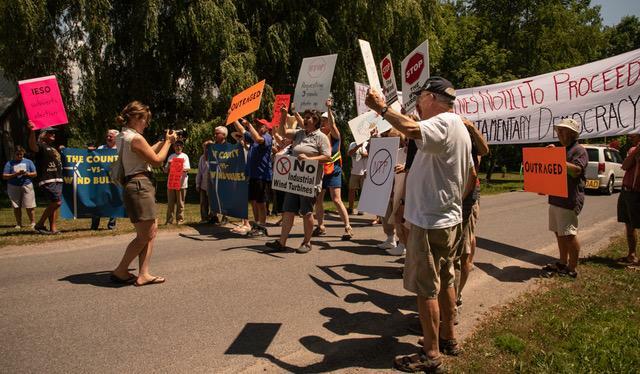 objections to the IESO approving the White Pines Notice to Proceed (NTP) application after the election was underway and contrary to government policy. The intent was not to halt the project but rather to send a clear and message to the Ontario Legislature of our dismay and objection. 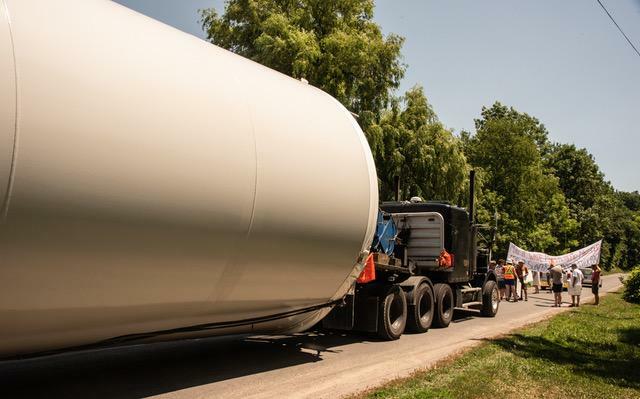 The group delayed the delivery convoy of large wind turbine parts for a short period for the photo op. The organizers clearly achieved their objective to send a strong message to Queen’s Park. Photo 1, Photo 2, Photo 3, Photo 4, Photo 5, Photo 6, Photo 7, Photo 8, Photo 9, Photo 10. Quinte News covered the APPEC and PECFN sponsored Walk-A-Thon for the Blanding’s Turtles on May 1st. 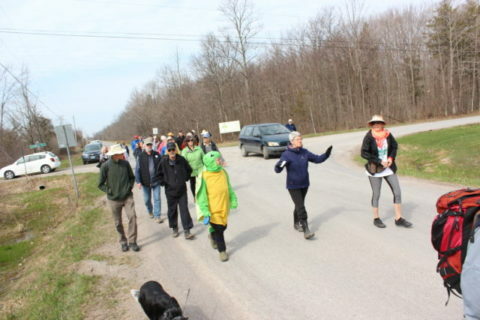 It was a nice day for a walk and a group of approximately 50 people came out to South Marysburgh Tuesday morning to participate in a walk-a-thon to protest the wind turbine project in Prince Edward County. (click here to read the whole article).